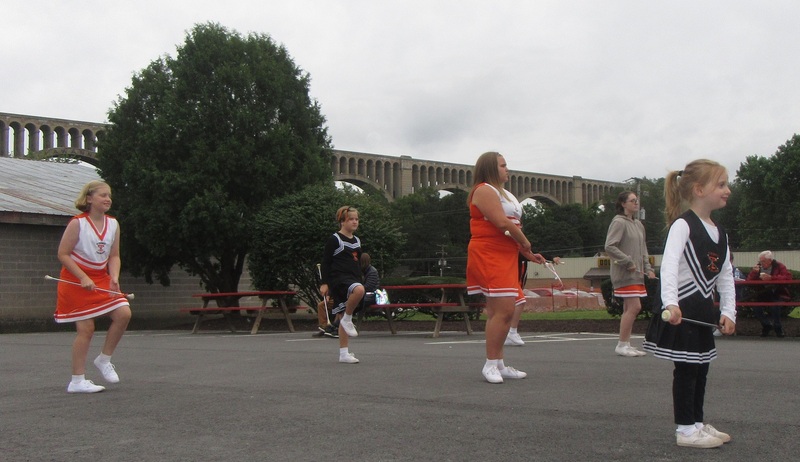 T-Town Twirlers (top, from left) Coralynn McHenry, Olivia Knoss, Dorie Cosner, Elizabeth Storr, and Emily Hadsall perform a patriotic routine for Bridge Day patrons. 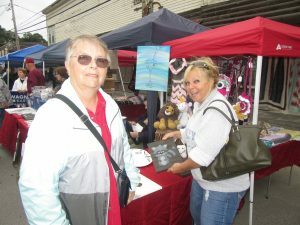 Above, Ann Bach (left) and Wendy Morrison of Meshoppen check out some of the vendor wares for sale on Nicholson’s Bridge Day. Vendors and scores of residents and visitors defied dire weather forecasts on Sunday to come out in droves for Bridge Day, an annual community celebration sponsored by the Nicholson Women’s Club. By most predictions, the day was to be stormy as the remains of Tropical Storm Gordon drifted through the state. 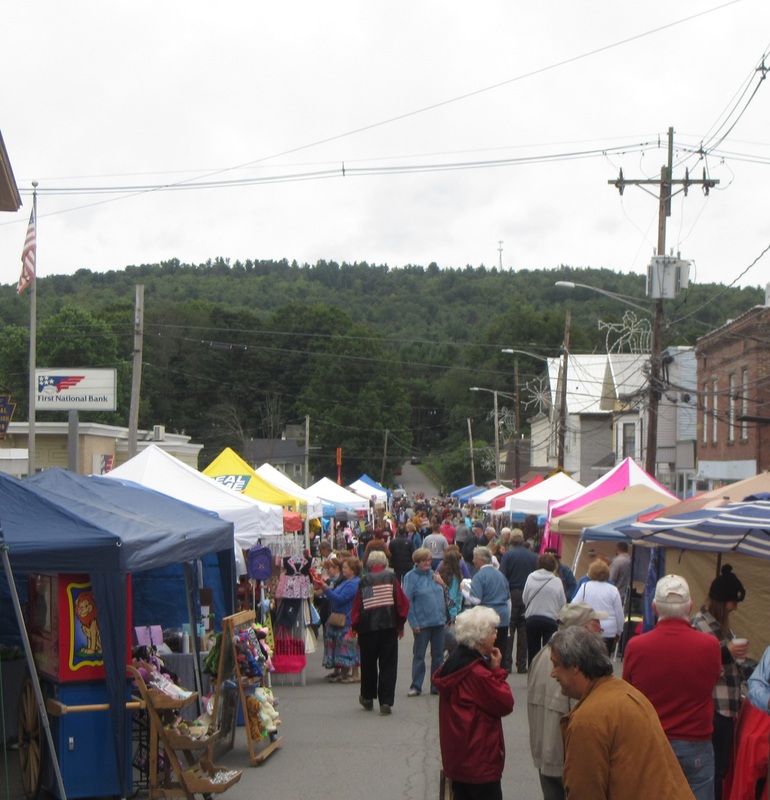 But the rain stayed just south of Nicholson all day, and the streets filled with throngs of people eager to get a bite to eat, listen to live music, and do some shopping with the magnificent Tunkhannock Viaduct serving as the backdrop. 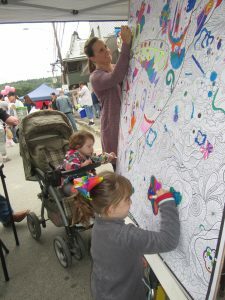 Bridge Day had a picture-perfect kickoff, Kupetsky noted. 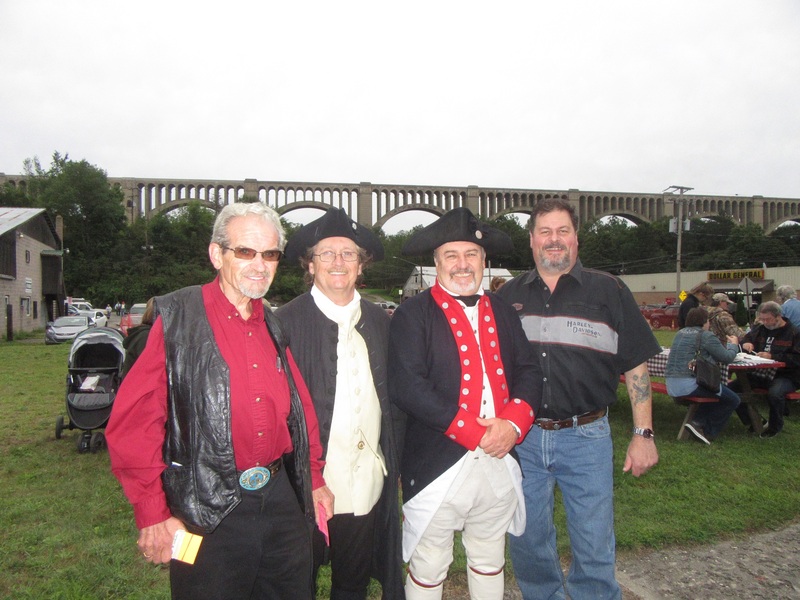 Just as local veterans and others assembled for the pledge to the flag and singing of the national anthem, a train crossed the bridge, causing everyone to stop and cheer. 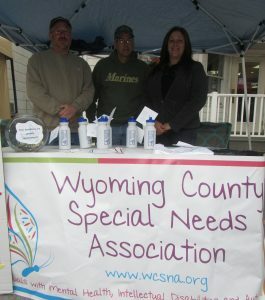 “It was a blessed start. 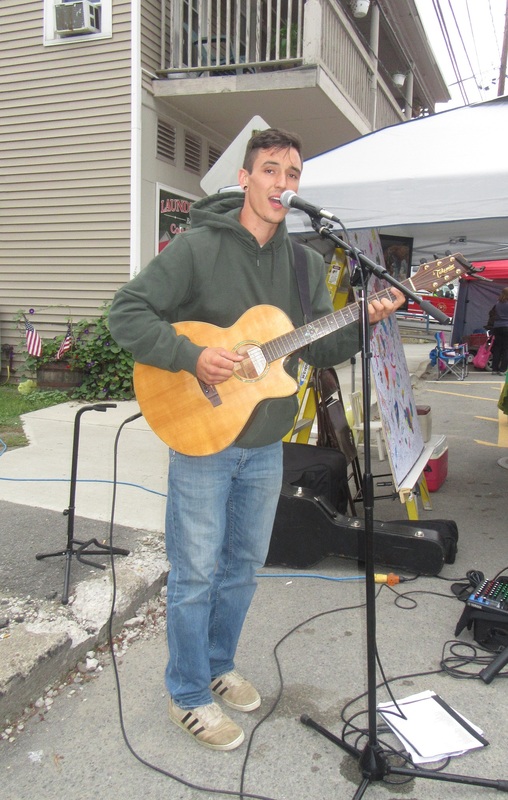 It was really special,” said Kupetsky. 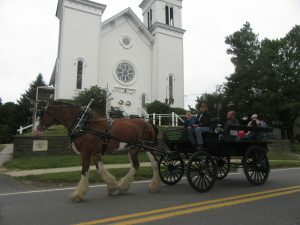 Golden Heart Carriage Services from Clifford provided rides (above) through the picturesque Wyoming County borough, as numerous entertainers, including the Mountain View High School Band, T-Town Twirlers, Local Concern Duo, and soloist James Johnson (below) kept toes tapping at both ends of Main Street, which was closed to vehicular traffic. More than 70 vendors sold a wide variety of handcrafted items and food. Keystone College volunteers conducted children’s activities behind the post office, where youths also got to pet and hold a variety of lop-eared rabbits. 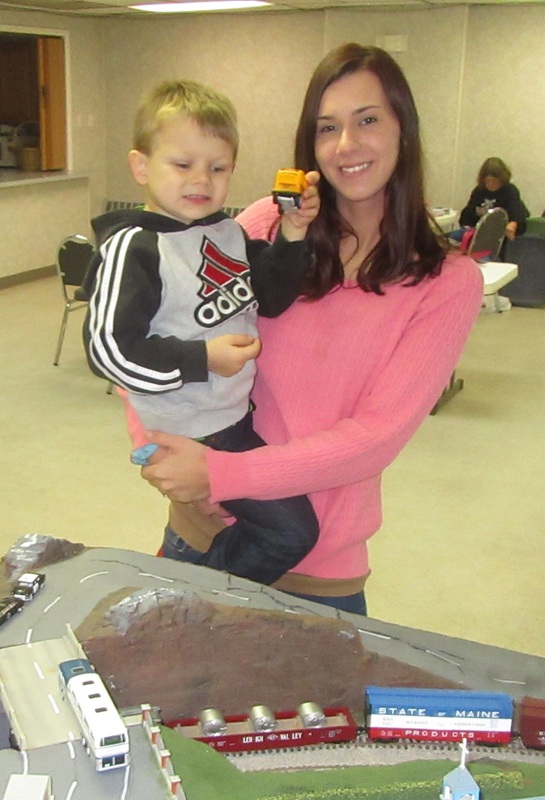 The Endless Mountains Model Railroad Club engaged visitors to the firehouse basement with a scavenger hunt geared toward getting model train fans of all ages to look for details in the club’s growing display. 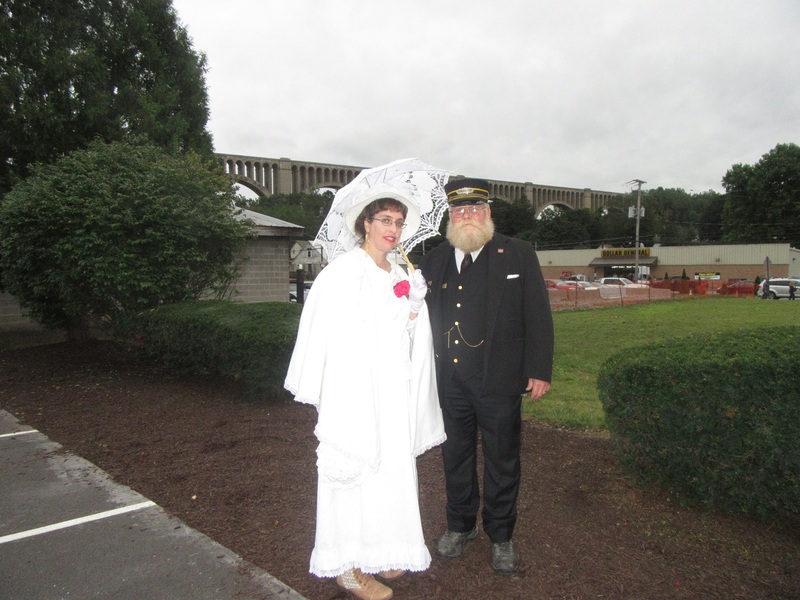 A new feature this year was the portrayal of Phoebe Snow and a Lackawanna Railroad conductor by Mary and Bob Frey (below) of Rome. The couple routinely volunteer at the Steamtown National Historic Site in Scranton and attended Nicholson Bridge Day last year on their own in street garb. 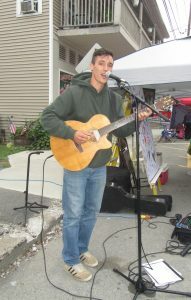 Bob related that it donned on him then that Phoebe and the conductor might be welcome additions to the attractions offered by the Woman’s Club. 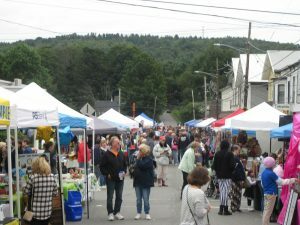 “They totally volunteered to come and be part of the event,” Kupetsky remarked, adding that, next year, the Woman’s Club hopes to encourage other patrons to dress in period costumes for prizes. Phoebe’s character, Bob noted, was created in about 1903 as part of a national advertising campaign touting the Lackawanna trains as a cleaner ride – and therefore kinder to ladies’ white dresses – because of the cleaner-burning anthracite coal used to power their locomotives. 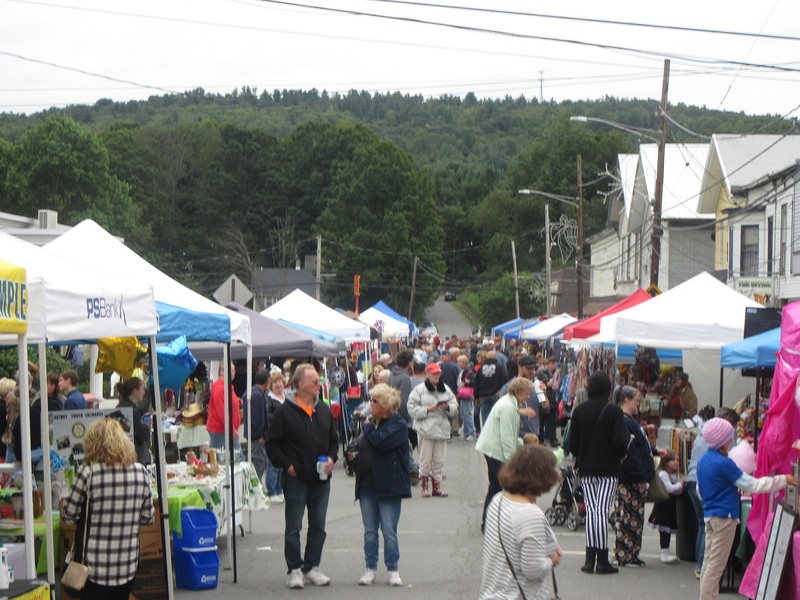 When the Tunkhannock Viaduct, locally known as the Nicholson Bridge, was completed for the Lackawanna Railroad in 1915, it was the largest steel-reinforced concrete structure in the world. It was placed on the National Historic Register in 1977, and the Woman’s Club started the Bridge Day celebration about 28 years ago when the community marked the 75th anniversary of the bridge. 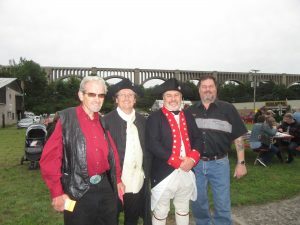 Wyoming County Commissioner Tom Henry (right) visits with (from left) David Davenport, Mark Walter, and Joe Clark, who were representing the Nicholson Mason Lodge and the local chapter of the Sons of the American Revolution. 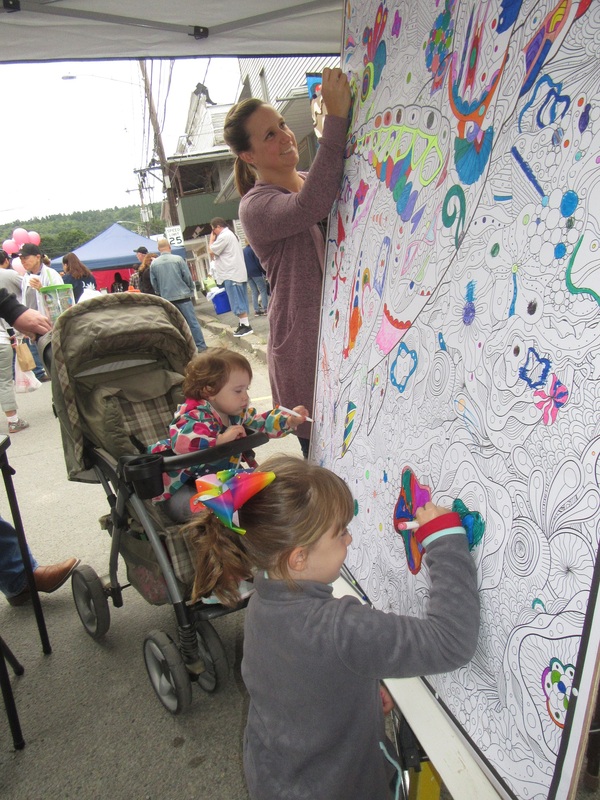 Adding dabs of color to a mural on Nicholson’s Main Street on Sunday were (from front) Natalie, Marcy and Jessica Bower of Nicholson. 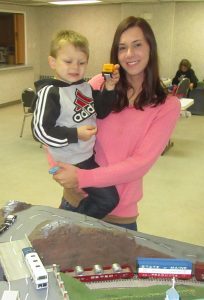 Josh Burgess, held by mom, Stephanie, was one of many children fascinated by the Endless Mountains Model Railroad Club train display set up in the basement of the firehouse. 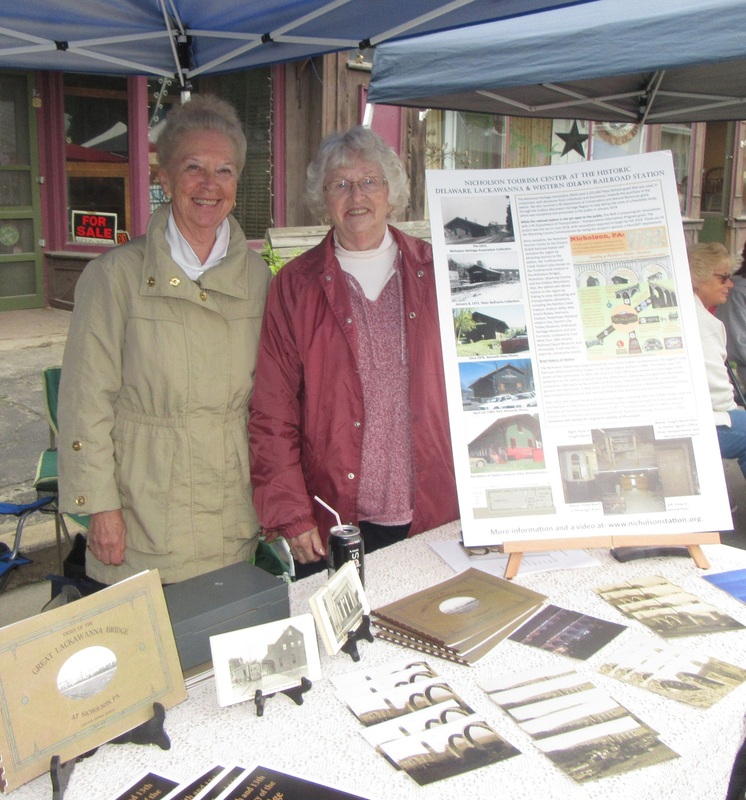 Offering a nice display of old Tunkhannock Viaduct photos and items for purchase were Nicholson Heritage Association secretary Joan Jenkins (left) and chairperson Marion Sweet. 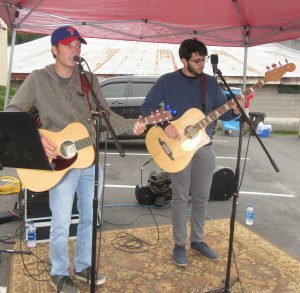 Matt Ord (left) and Chris Benitez, performing as Local Concern Duo, pleased the crowd with covers of rock and alternative tunes. 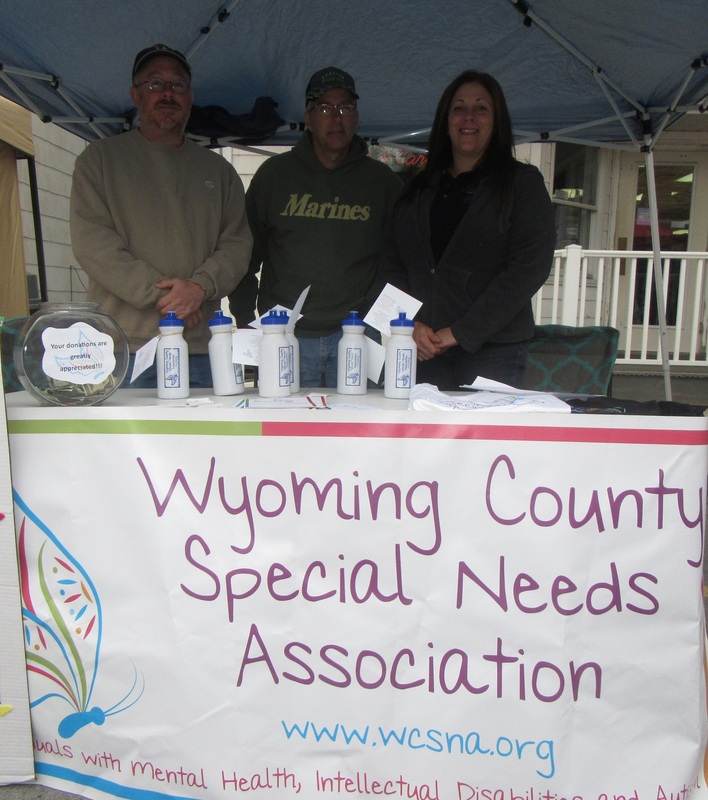 Representing Wyoming County Special Needs Association were (from left) board president Chad Kneisel, vice president John Lee and associate director Jackie Simmons. 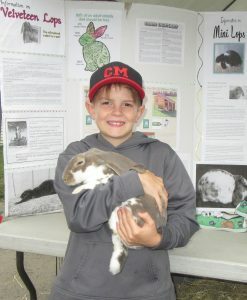 Aaden Cobb of Factoryville makes friends with a velveteen lop, brought to Bridge Day by Country Cove Rabbitry. Crowds exceeded expectations in Nicholson on Sunday when forecast rains kept their distance from the community Bridge Day celebration.